Translation:The dog runs from the moose. does this mean that the dog is running away from the elk or it started running from the point where the elk is? It could mean either, but it most likely means the first one. Does anyone's dog actually run away from moose? Mine always runs toward them. Well, moose are pretty large, intimidating creatures...but dogs are pretty foolhardy ones, too. Are moose really as common in Sweden as the stereotype (and these lessons) would have me believe? They're pretty common. You definitely have to watch out for them when driving in the countryside. I googled it and in the summertime there are 300 000-400 000 moose in Sweden. Wikipedia gave me this interesting tidbit that I feel I have to share: in Denmark, they've only had one known moose so far. It swam over from Sweden July 14th 1999. The Danish society for protecting animals promptly set up a moose warning sign much like the ones we have here, in Humlebæk where the moose lived. Unfortunately the poor creature was killed by a train the following year, so now they're moose-less again. The fall is moose hunting season in Sweden, and especially in the north it's a thing. 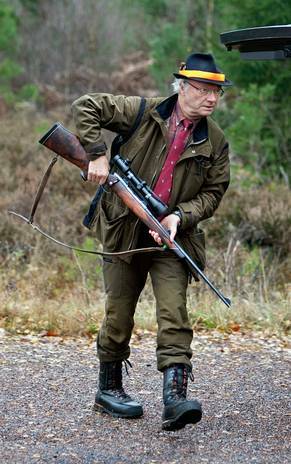 The king even goes on a moose hunt yearly. Hahahaha. Oh this made me chuckle. Is that King Karl Gustav? Varför har han på sig en slips? Dang... and I guessed that springer meant "jumps"
It is misleading, isn't it? The word for jump is hoppar, which looks like it would be hop, but it really isn't. Learn Swedish in just 5 minutes a day. For free.